If you follow sports at all or even just glance at the news you probably know that the Tour de France is overwith as of yesterday July 25th. You may have picked up that Alberto Contador won his third Tour. In the news this race was as much about Lance Armstrong’s FAILURE TO REPEAT as it was about Contador’s win (battling Andy Schleck). Much was made of Armstrong’s crashes and flats and his “old” legs. He only finished 23rd, out of 170 riders, thus “failing” at his comeback and a ride to glory. Armstrong had plenty of personal reasons to withdraw early from the race. It was obvious from the end of week one that he was not going to win. He could have avoided the “embarassment” of not winning. He could have avoided all the press questions about being “old.” He could have avoided the physical pain of riding long days with scrapes, bumps and bruises. He could have avoided having to hand over his leadership position to someone else. He could have avoided having to support a teammate who was a “lesser” rider. But he didn’t! He rode everyday. He pushed when he was needed and he supported as needed. He did improve his personal standing but MORE IMPORTANTLY he stayed in a leadership position to allow his TEAM to compete for the championship. And compete they did. The Radioshack team, managed by Johann Bruneel and lead by Lance Armstrong finished as the number one team in the Tour de France. As a leader Armstrong set aside his personal travails and made sure the team prospered. He set an example that the younger riders learned from and provided an example to all of us of leadership. 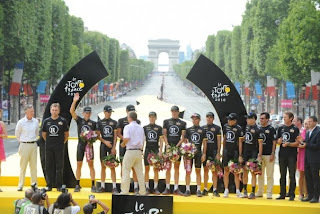 As a result his team prospered, his team was rewarded (reputation-wise and financially) and he ended his last Tour de France in a manner befitting a champion. Lesson learned: Leadership is not about personal glory, it is about the success of those you lead. The big lesson for me here is that even very public leaders can mature and evolve. What is most impressive about Lance staying in the tour is what it means for him personally. By assuming a supporting role on the team he went a long way towards correcting the well known perception within racing circles that his team is all about him and his win. It's a great thought that we are not limited by our past leadership shortcomings or perceptions. It's natural to expect our leaders to grow and mature. We need to expect better from them and ourselves over time! This is a great lesson. Humbling ourselves for the good of everyone around us is a very hard thing to do. He was in it for the team win, have to admire that! Next post: Are Men In HR Going the Way of the Dinosaur?